Confessions of a Professional Blogger is a new book where Miranda Marquit walks the reader through her career path as a freelance writer. Miranda covers every aspect of being a freelancer, including the challenges, the tough dilemmas and what it takes to build up a sustainable business as a professional writer. In my opinion, the little details about how the industry works, revealed through the book, distinguish this book from any other handbook on the market. 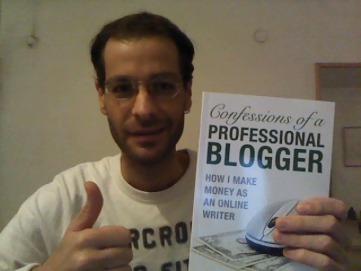 The book is very realistic and leads you to build a solid foundation for your writing business. It is your sole decision whether you’ll keep it small just to have a small revenue stream or to scale it up to a full income. You will not find any hype language in it that promises you untold riches. Instead, you’ll find the steps you need to take to build up a sustainable freelance writing business. As Miranda gets in to details, she actually exposes many secretes of the trade. This, by itself, is the most valuable benefit of the book. Instead of having only few pieces of the puzzle and facing difficulties to make decisions, you’ll have the full picture of how the industry works. You’ll be able to make much better decisions, as you’ll have much less uncertainty and much more confidence. You can learn from your mistakes, but it is even better to learn from other people’s mistakes and avoid them altogether. By having confidence in the right choices, you are able to concentrate on actions that will help you build and grow your freelance writing business. All that while you have realistic expectations and estimations help you draw a valid road map. The good money and the bad money – the gigs where you will get decent money and the gigs that will make you a writing slave. Do you really need to be an expert on the subject that you write on? What to avoid in order to maintain a good reputation as a writer. Understanding the scope of the services you provide. Ideas for standing out from the crowd – having your own twist to add value to your clients. Opportunities beyond writing as you grow your business. Miranda also shares all the challenges she has faced and the way she confronted them, as well as the dilemmas she had to deal with. Those include where to find jobs, how to find them, how to position herself, how to deal with different clients, when to say NO to a job, how much to charge, how and when to raise prices, and much more. She explains the reasons behind her decisions while also providing the alternatives that she could choose from. It’s pretty obvious that writers and aspiring writers for hire will get the most out of this book. But they are not the only ones. Other freelancers, especially those that provide online services like designers, programmers etc. will find it very useful. Publishers, including blog owners will better understand their writers. Business owners or marketing managers that have, or plan to have, an online presence will find lots of interesting information that can help them in their overall marketing strategy. After all the things I’ve mentioned above, I’m embarrassed to speak about the price of this book. There is such a huge gap between the valuable information you get from the book and the ridiculous low price of it. So, disregarding the price, I strongly encourage you to read it!